For over a thousand years the pyramids of Egypt have proven fertile ground for the speculations of serious scholars and eccentric thinkers. In the past, when knowledge of Egyptian civilisation was less complete than it is now, the Greek philosopher Aristotle thought these tombs had been built as a display of royal power, while the Roman historian Ammianus Marcellinus (born circa 330 AD) speculated that they were vaults containing ancient wisdom. Thanks to the work of competent historians and archaeologists, we now know that the pyramids were tombs designed to protect the pharaoh’s body, and act as a kind of staircase whereby his soul could ascend to the realm of the gods. These sober facts, however, have not stopped all manners of outlandish theories being manufactured – from the idea that their proportions embody divine wisdom, that they are products of alien technology, to sources of mysterious energy. The purpose of this essay is to examine these and other related beliefs with the view to determining their veracity. The modem cult of pyramidology emerged from the beliefs of John Taylor, a London publisher. His ideas, which were expounded in his book The Great Pyramid: Why Was It Built? And Who Built It? (1859) were, in essence that the Great Pyramid had been built by Noah and his sons, with the aid of divine guidance. Taylor reached this conclusion because he felt the ratio of its proportions expressed relationships to the natural world that were beyond the level of knowledge possessed by the ancient Egyptians. That the height of the pyramid multiplied by ten to the ninth power yields the distance from earth to the sun. That the height of the pyramid is 1/270,000 of the earth’s circumference. That the mass of the pyramid is one trillionth that of the earth. That the sarcophagus in the pyramid is a standard of measurement, the volume of which is one tenth of a cube whose edge is twice the Pyramid Inch (more on the Pyramid Inch later) multiplied by the earth’s specific gravity. That the measurement of the pyramid’s Grand Gallery encodes the future history of Humanity (Smyth borrowed this idea from a Scot named Robert Menzies). 1. The original height and mass of the pyramid can’t be known with certainty because nearly all the fine casing stones and capstone were used by the Muslim rulers of medieval Cairo for the construction of houses and bridges in and around the city. In view of this fact, Smyth’s assertions based, as they are, on the various ratios of the pyramid’s dimensions in relation to aspects of the cosmos are, at best, inaccurate. Moreover, the majority of the measurements he made during his examination of the Great Pyramid were grossly inaccurate, as was discovered by the Egyptologist, Sir Flinders Petrie who conducted subsequent surveys of the tomb. (A) Why base this measurement on the size of one particular stone, rather than another? (B) Why divide the width rather than the length? (C) Why divide by twenty five? (A) Why must the cube have sides measuring two Pyramid Inches? (B) Why must the volume of this cube be divided by ten? (C) Why must the resultant figure be multiplied by the earth’s specific gravity? In the final analysis, there is no logical reason why any of these figures should have special significance. 5. The idea that knowledge of future events can be derived from pyramids was soon shown to be unsound – Smyth’s prediction that the Second Coming of Christ would occur in 1881 failed, and the founder of Jehovah’s Witness, Charles Taze Russell, met with similar lack of success when he prophesised the Millennium would occur at the close of 1914. The Olmecs, Maya, and Aztecs of Central and South America also constructed pyramids. Is there a connection between these civilizations and that of ancient Egypt? Did the Egyptians transmit their knowledge of pyramid construction to the New World, or did these civilizations obtain their knowledge from a common source – Atlantis, perhaps? The problem with believing the pyramids of Egypt and those of Mesoamerica are related in some way is that archaeological evidence does not support this idea. Firstly, in Egypt, pyramid construction declined, and by the end of the Middle Kingdom (1786 BC) had been largely abandoned. In the New World, however, the Olmecs – probably the earliest civilization of the region – constructed the large clay pyramid in their ceremonial centre at La Venta circa 1000 BC. Given that the Mesoamerican civilizations were separated from Egypt in time as well as space, it is more reasonable to conclude that New World pyramids are of independent origin. If, for example, Central and South America had been colonized by Atlantians or Egyptians, then there would be far greater similarity between the civilizations of Egypt and Mesoamerica with respect to language and religion, etc. Secondly, the evolution of New World pyramids, like those of Egypt, can be traced from simple beginnings – namely, ceremonial platforms or mounds. There is no evidence of a sudden development that would indicate the idea was introduced from an external source, nor any sign that advanced technology was used in their construction. And thirdly, the structures served different purposes – the Egyptian pyramids were designed as tombs, whereas the Mesoamerican type were surmounted by temples and served as elaborate theatres for the performance of religious rituals, often involving human sacrifice. The most well known proponent of the idea that extraterrestrials may have been involved in the construction of Egyptian pyramids is Eric von Daniken. These beliefs are presented in his book Chariots of the Gods, where it is claimed that in the remote past aliens visited earth, accelerated the development of human evolution and civilization, and that certain ancient structures, such as the pyramids, support this contention. No rope to haul the stone blocks. Not enough wood for the rollers used to move the stone blocks. Not enough food to feed the thousands of labourers needed for construction. No tools hard enough to cut the stone blocks. Unfortunately for von Daniken, the archaeological evidence refutes all the above objections. Firstly, the Egyptians did have rope – it was made from flax or palm fibre. Secondly, rollers have been found in the debris left by the workmen who built the pyramid of Sesostris II at Lahun. The Egyptians, however, probably made greater use of sleds for moving stones (as depicted in Lord Dehutihotep’s tomb painting) as these are more efficient. Thirdly, in ancient times there was about 12,000 square miles of cultivable land in Egypt. This was a small, but very fertile area, thanks to the annual flood of the Nile, which deposited rich alluvial soil along the banks and delta of the river. Indeed, the fact that Egyptians often exported grain shows food shortages were the exception, rather than the rule. Fourthly, archaeologists have not found any evidence that advanced technology was used in pyramid construction – the stones were cut with neither diamond saws nor lasers. Indeed, the stone blocks used to build the pyramids all bear the marks of the pre scientific tools that were used to shape them – stone hammers, copper chisels and saws. Moreover, these tools have been found in the quarries where the stone for the pyramids was cut, and around the construction sites where they were built. Furthermore, the names of some pyramid work gangs have been found inscribed on the blocks of stone that were used to construct these tombs. This clearly shows that Egyptians built them. Fifthly, the development of pyramid architecture was one of gradual evolution from the mastabas (flat topped, slope sided mud brick tombs) constructed at the beginning of the dynastic era to the step pyramid of King Djoser (Third Dynasty) that is reputed to have been designed by his architect, Imhotep; to the fully developed form of the Fourth Dynasty as exemplified by the Great Pyramid at Giza. Pyramid Power is the belief that objects of this shape are able to focus or concentrate a mysterious energy that can, among other things, sharpen razor blades, preserve food and mummify dead animals. This idea appears to have originated with Antonine Bovis, the proprietor of a hardware store in Nice, France; further developed by Karel Drbal, a Czech electrical engineer who patented a pyramid shaped razor blade sharpener; and popularised by Lyall Watson in his book Supernature (1973). Generally speaking, believers usually claim that pyramid energy is concentrated electromagnetic radiation, elan vital (life force), or some other elusive entity. Unfortunately, none of these claims withstand close scrutiny. Electromagnetic energy consists of a broad spectrum of radiation that includes infrared, visible light, ultraviolet, x ray and gamma rays. Could a pyramid focus any of this energy? Unfortunately for believers the answer is a definite no. Firstly, pyramids do not possess the properties of a lens – even if they were constructed from transparent material, their geometry will not refract light rays to a focal point. Secondly, the only other possibility – the magnetic lens, which converges charged particles by magnetic fields – is not an option because pyramids, whether they are the pyramids of Egypt or cardboard models of them, are non magnetic in nature. Thirdly, if pyramids were focusing electromagnetic radiation, the phenomena associated with this process should be present, yet it is not. For example, in order to sharpen a razor, metal would have to be removed from the blade’s edge. In theory, this could be achieved by highly monochromatic electromagnetic energy – in other words a laser beam. The problem is that an operating laser generates an intense ray of light that produces a shower of sparks when it cuts through steel. Unfortunately for believers, none of these effects are observed within the interior of pyramids. Concerning food preservation – irradiating food with gamma rays would kill the bacteria responsible for decay. However, if pyramids were concentrating high energy radiation, then bystanders would also be exposed to this energy and, as a consequence, receive radiation burns and fall ill with radiation sickness. Finally, if pyramids act as lenses for electromagnetic radiation, then the larger the pyramid, the more powerful the effect should be. However, the Great Pyramid, which is the largest of its kind in Egypt, has left thousands of tourists unscathed – none have fallen ill with radiation sickness, or been vaporised by beams of electromagnetic energy. In the light of the above, it is clear that electromagnetic radiation is unable to provide a theoretical foundation for pyramid power. Consequently, the remaining alternatives — elan vital and energies unknown to science – must be considered. Investigation into the biochemical processes of living things has revealed all forms of life owe their existence to complex chemical reactions that are fundamentally material in nature. There is simply no evidence that would require biologists to postulate some mysterious spiritual essence in order to account for physiological processes such as growth, reproduction and the phenomena of mind. In view of these facts, it appears unlikely that there is any Life Force for pyramids to concentrate. Finally, if known forces are unable to account for the alleged phenomena of pyramid power, could some unknown energy be involved? It is always possible that forces unknown to science exist, however, as forces arise from fundamental subatomic particles, a new class of particles would need to exist and, to date, there is no evidence that can substantiate claims based on this possibility. If there is no theoretical foundation for pyramid power, then how do we account for the claims made by believers? 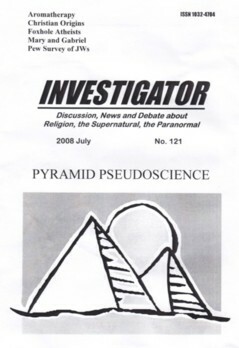 Although some claims may be nothing more than outright lies, it is possible that a firm belief in the reality of the phenomena may predispose some individuals to perceive what they expect to see – razor blades seem to last longer when placed under pyramids, and food seems to decay less rapidly when treated in the same way. (1) The experience gained by starting with small scale structures, and progressively building larger and larger ones. (2) The ability to conscript a large labour force. (3) Good organization and planning. (4) The driving force of religious motivation. Bushnell, G.H.S. The First Americans: The Pre-Columbian Civilizations, Thames & Hudson, London, 1968. Cassen, L. Ancient Egypt, Time Life International, 1980. Colligan, D. Strange Energies, Hidden Powers, Scholastic Book Services, New York, 1979. De Camp, L.S. & C. C. Ancient Ruins & Archaeology, Rigby Limited, Adelaide, 1965. Grant, J. A Directory of Discarded Ideas, Corgi Books, Great Britain, 1983. Lissner, I. The Living Past, Jonathan Cape Ltd., London, 1957. Pyke. M Red Rag to a Bull: Dr Magnus Pyke’s Dictionary of Fallacies, Willow Books, London, 1983. Von Daniken, E. Chariots of the Gods?, Corgi Books, London,1972. White, P. The Past is Human, Angus & Robertson Publishers, Sydney, 1979.